Sharing information with players and other makers is an important part of my work. I’ve been invited to give talks at conferences, and written articles for specialised publications. 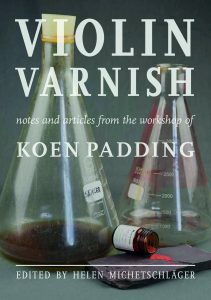 In 2015 I published a book of the writings of the late Koen Padding, whose expertise about violin varnish was recognised worldwide. Koen Padding was well-known through his company, Magister, which produced historically-informed varnish products for violins. After his death in 2012, I decided to collect and publish the information he had made available in his lifetime. This book contains the articles that Koen Padding wrote for specialist publications, the notes he provided with his products, information he gave to users of his products, details of materials left in his workshop on his death and the orders he made from specialist suppliers, and chemical analysis of some Magister products. The book is a nonprofit venture and proceeds from the sale have benefited musical and aid charities. The book was published in 2015.